Finishing your basement is an excellent addition to your house. You'll add living space for less than an above-ground expansion. While you're in the midst of planning the space layout don't forget to give some attention to the floor. 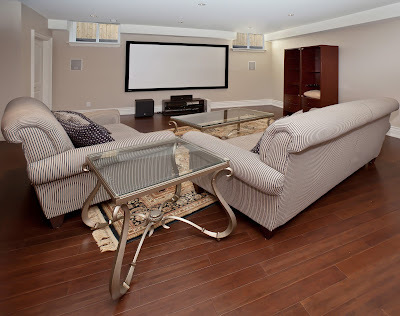 Basements are prone to moisture issues so you'll want to be practical when you select flooring. Kermans flooring store in Indianapolis has some advice for picking basement flooring that's pretty and practical. Before remodeling, your basement floor is most likely concrete. That means you'll need to pick a floor that can be installed on concrete and won't have an issue with moisture that may seep up through the porous foundation. Stay away from ceramic or stone tiles - they have very particular installation needs. Hardwood floors are also out. They can't be installed on concrete and are a bad match for any area that has moisture - water can permanently damage a hardwood floor. What floors are good picks? You can go with carpet, ideally with a water-resistant layer beneath, but we recommend to do so sparingly simply because of potential water damage. Our top pick for basement flooring is luxury vinyl. Luxury vinyl offers an incredibly realistic look in ceramic, stone or wood. It's very easy to clean and comfortable underfoot. Learn more of the benefits of Luxury Vinyl Tile. Will you be using your basement for entertaining? Are you adding a guest room in the basement? Will the basement be a quiet area for an office or sewing room? Let the use of the room help point you in the best direction for flooring choice. Warmer colors such as rich browns or red tones can add a cozy feel to the basement. Cool tones such as gray might open up the space and make the furnishings the focal point. Luxury vinyl tile gives you a wide range of color and style options. You might also consider adding an area rug to help define space in an open area and add additional color. Stop by Indianapolis flooring store Kermans to review your options. While you're there, take advantage of our in-house design experts to help you narrow down the choices.